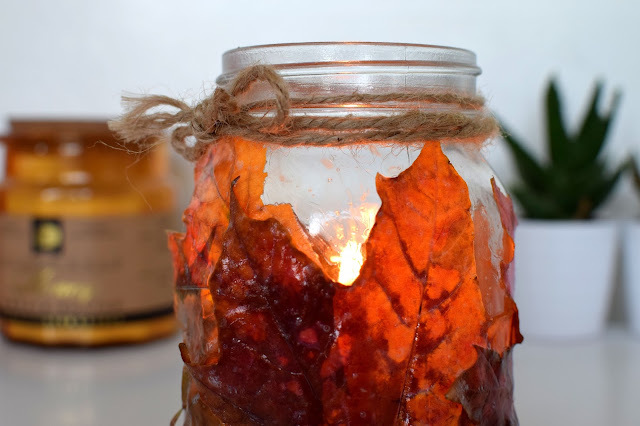 There's something about Autumn/Winter that just makes me want to be really crafty, I blame Pinterest! 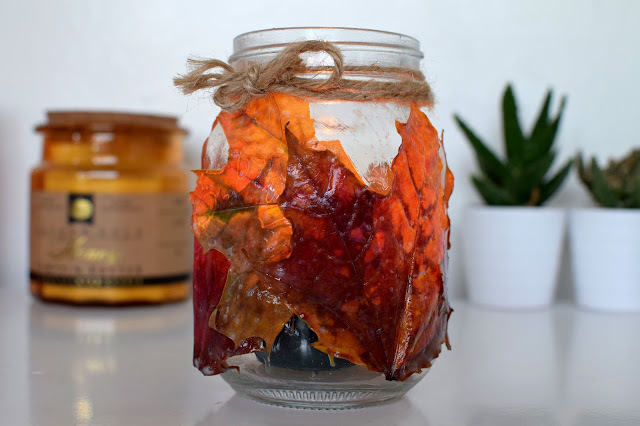 Anyway while I was browsing I saw this little DIY of making a candle holder out of a mason jar and some Autumn leaves! I love how the leaves light up, such a gorgeous colour! To start off, grab your mason jar and test out your leaf placement, try to alternate colours, make sure all the sizes fit alright. Remove stems from the leaves. Once you've got your placement sorted out, put some kitchen roll down or something to protect your surface. 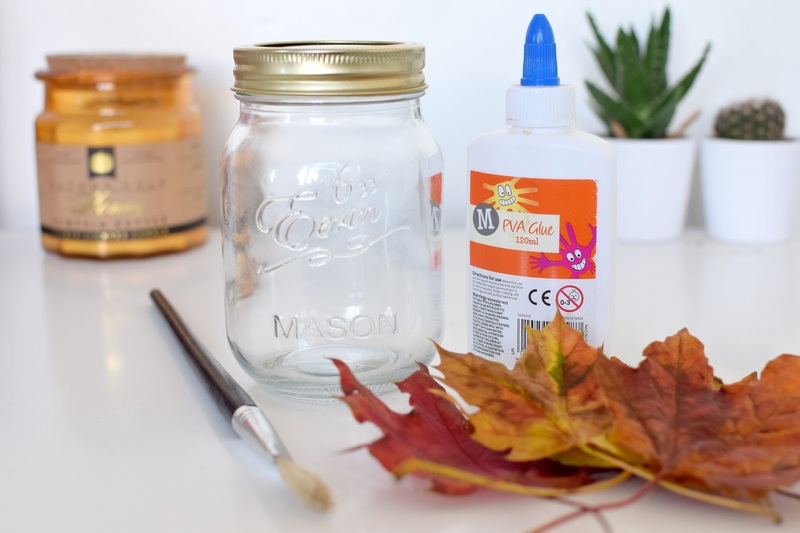 Grab your paintbrush and start painting the back of the leaves with the PVA glue. 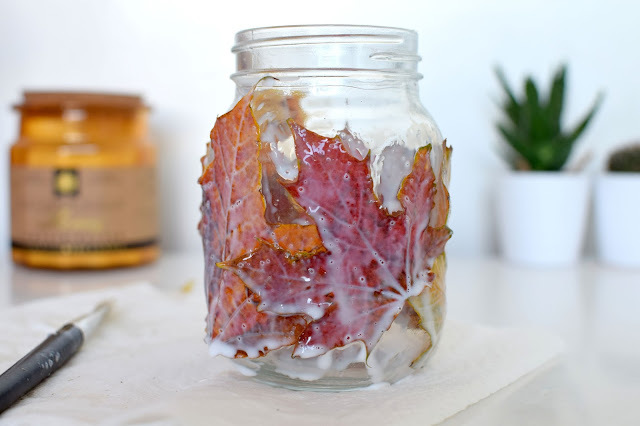 Start glueing the leaves on the jar, make sure to hold down the leaves for a few seconds to keep them in place. Once they're all glued in place, start covering the top of the leaves with the PVA glue. Allow the glue to dry until clear, I repeated this 3 times, to make sure they were all stuck on properly. Once your jar is dry, grab some rope or raffia, whatever you like, to tie around the top to decorate. Finally pop in a candle of your choice! 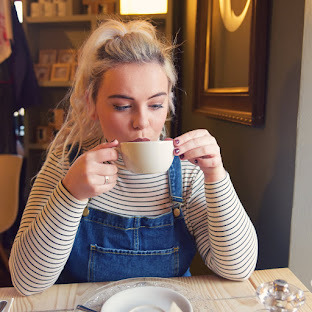 This looks so pretty - what a great diy idea!